Having been able to discern a way up the cliff, Pilgrim now finds that the going is distinctly easier – and indeed nearer to civilisation - because he comes upon a metalled road. 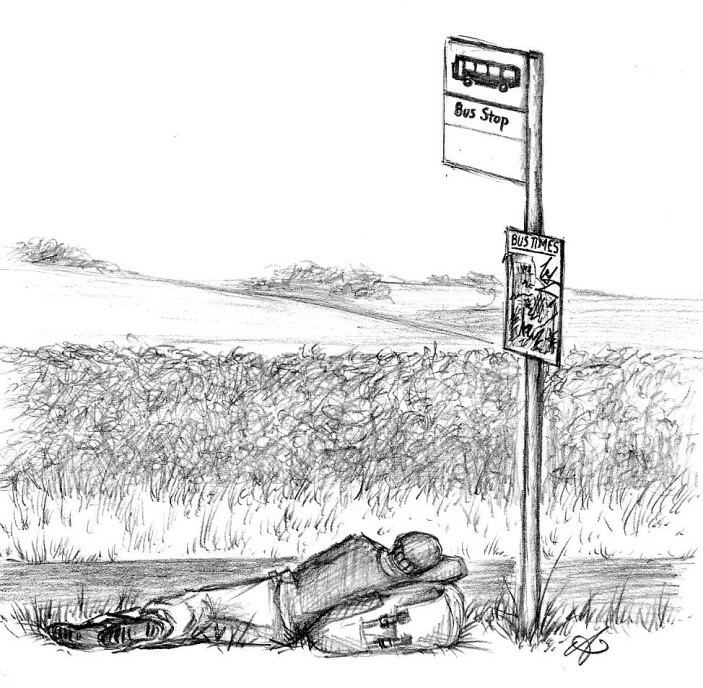 In what looks to be the middle of nowhere, he even finds a weatherworn bus stop and his spirits soar with the idea of taking the weight off his feet. But the time-table is indistinct, either weather or vandals – who knows? He settles down to wait, not knowing when - or even if - a bus will ever come. This week our theme is “Missed the bus”. Very often, when our plans for the future turn to dust and ashes, we have to stop and rethink all our options in the light of the recent past. Even when there appears to be no obvious direction, we find that we have just to keep on keeping on, to live each day in faith until – in an unexpected way – God’s bus takes us by a different route towards a better outcome, but we may not realise this until after it’s all happened !